When working with hundreds of computers and users you may have found ‘your’ way of managing printers. But Windows 7 sometimes (may be together with its users) thwart your plans. 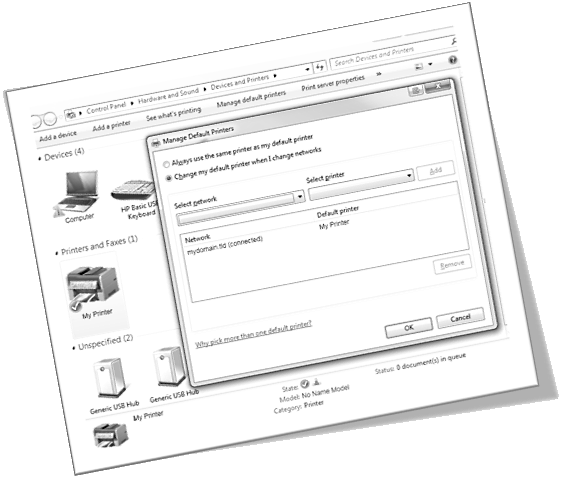 Since there is a configuration dialog in the start menu called Devices and Printers from where you can “manage default printers” every user can manually select which printer to set as default in a certain network. Well, I don’t want my users to choose which printer they get connected. I want them to use the printer they have at their office! So what now? As far as I know, you cannot disable this dialog, but you can override any settings a user made. You can create a group policy object and deploy a registry item that always sets this setting to “Always use the same printer as my default printer”. Of course the user can switch it back to “Change my default printer when I change networks” but this will last until the next logon, he?! Simply create a new group policy object on a user ou, navigate to User Configuration > Preferences > Windows Settings > Registry, create a new registry item, choose Update as action, select HKEY_CURRENT_USER as hive, type Printers\Defaults as Key Path, type Disabled as Value Name choose REG_DWORD as type and enter 1 as Value data. Thats it! great info, I think this was the cause of “random” default printer switching. @Kerr: I had this problem when taking laptops out of their docking stations. When automatically switching to wifi users always had a different default printer as they used to have when working over lan.